I purchased several cuts with all dresses in mind for the summer. Fast forward and I finally found a simple pattern that would work with this bold print. New Look 6049: Workroom from Project Runway, misses sleeveless mini-dress and three-quarter sleeve tunic was the perfect clean slate I needed. Went with Version A and used the sleeves from Version B and shortened. I love a bold & dramatic print, I guess it stems from having a tranquil/drama free lifestyle and my subconscious seeks it in my fabrics....lol In comes this b/w cheetah/zebra/giraffe animal print with its bold electric blue stripe. 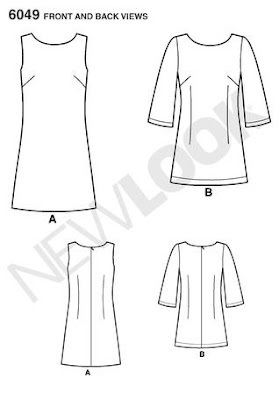 A quick tissue fit and finished garment measurement check required I cut the pattern down from a 16 to a 14 for the body and armhole, 12 for the shoulders & neckline since I was using a knit. After machine basting the dress together with 3/8" seam allowances, minus the bust darts & waist darts, tried on, and opted out of the darts and serged the seams between 7/16" & 1/2" for a closer fit. Although I cut the sleeves at 14, I ended up removing a smidge from the sleeve cap. Also, I had to put in front/back neckline darts. Fully lined the body of dress with a medium weight black tricot gifted to me... totally love lining with tricot. However, I am learning that one must tread carefully when lining with tricot. I currently have a dress that I made using a light weight fashion fabric knit and used a med. weight tricot and it appears the weight of the lining is pulling the dress. Sooo, I haven't worn it because I need to remove the lining... uggh. ok... where was I, yes... my dramatic dress. I llllllllllllllllooove this print, its screams hear me RoaR... lol. The weather is a tad bit warmer and opted for a black refashioned short sleeve blazer, but trust & believe I have my rideordie pashmina. Love it. The colors are fabulous! I LOVE your dress, Sheila! Wonderful work! Wonderful dress - the print is indeed to die for! Love it with the jacket also. I love your dress. The fabric is fabulous! Gorgeous Sheila! Love that print. This is really pretty. That print is wildly awesome. Wow, Wow!!! What a great fabric find!! Love the dress, so pretty! Thank you Janie ! The jacket is rtw and refashioned to short sleeves a few years ago. OMG! Fantasticccccccc! You did a beautiful job. I love this dress! It looks so good on you too! Sheila, you did a great job pulling this one together! I really like what you've done here and sure you will get lots of wear from it years to come! Thank you Shannon & Myra !